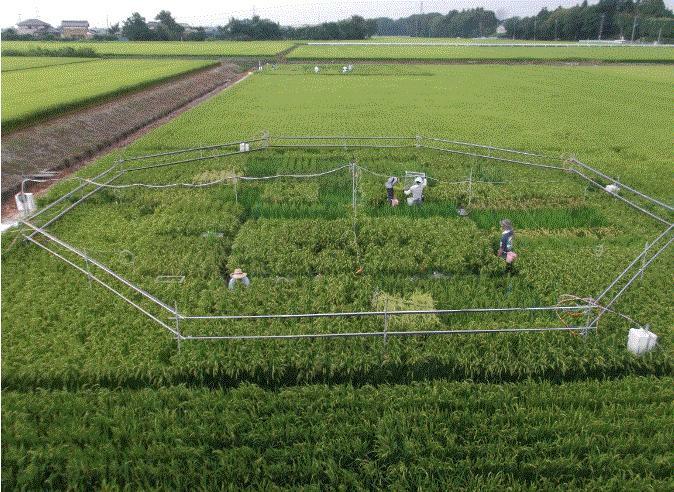 The study, published May 23 in Science Advances, showed for the first time that rice grown at concentrations of atmospheric CO2 expected by the end of this century has lower levels of four key B vitamins. The findings also support research from other field studies showing rice grown under higher CO2 concentrations has less protein, iron and zinc. Rice is the primary source of food for more than 2 billion people. Decreases in the nutritional content of rice could have a disproportionate impact on health outcomes in the poorest rice-dependent countries, according to the team, which includes researchers from the University of Washington School of Public Health and School of Medicine. "Rice has been a dietary staple for thousands of years for many populations in Asia and is the fastest growing food staple in Africa," said co-author Kristie Ebi, director of the UW Center for Health & the Global Environment and professor of both global health and environmental and occupational health sciences. "Reductions in the nutritional quality of rice could affect maternal and child health for millions of people." The nutritional deficits are likely to hit hardest in countries where rice makes up a major portion of daily diets. About 600 million people, mostly in Southeast Asia, get more than half of their daily calories and protein directly from rice. Researchers said CO2-induced changes in the nutritional quality of rice would likely "exacerbate the overall burden of disease and could affect early childhood development," researchers said, noting that undernutrition can worsen diarrheal disease and malaria. CO2-induced nutritional deficits are projected to be greater for those countries with the lowest overall gross domestic product per capita, the study showed. "This study provides important insights into how higher CO2 concentrations could affect the nutritional quality of multiple varieties of rice, identifying for the first time that the concentrations of B vitamins will be reduced with greater emissions of CO2. This is an underappreciated risk of burning of fossil fuels and deforestation," said Ebi. Some studies have noted that higher levels of CO2 spur plant growth through increased photosynthesis. "People say more CO2 is plant food — and it is. But how plants respond to that sudden increase in food will impact human health as well, from nutritional deficits, to ethno-pharmacology, to seasonal pollen allergies — in ways that we don't yet understand," said study co-author Lewis Ziska, research plant physiologist for the Adaptive Cropping Systems Lab of the United States Department of Agriculture's Agricultural Research Service. The authors said there's a need for researchers, including agronomists, epidemiologists, physiologists, nutritionists, and health care providers, to accurately quantify the nature of CO2-induced changes in people's nutritional health and any associated health outcomes. Research also is needed to identify options to reduce or negate the risks, including studies to understand whether traditional breeding or genetic modification could lead to nutritionally superior rice, and understanding whether the nutritional quality of rice could be improved through the application of mineral fertilizers or post-harvest fortification. Ebi and Adam Drewnowski, professor of epidemiology and director of the Center for Public Health Nutrition at the School of Public Health, were co-authors from the University of Washington. The lead author was Chunwu Zhu of the State Key Laboratory of Soil and Sustainable Agriculture, Institute of Soil Science, Chinese Academy of Sciences, Nanjing. The research team included scientists from the USDA; University of Tokyo; Bryan College of Health Sciences in Lincoln, Nebraska; and the University of Southern Queensland.